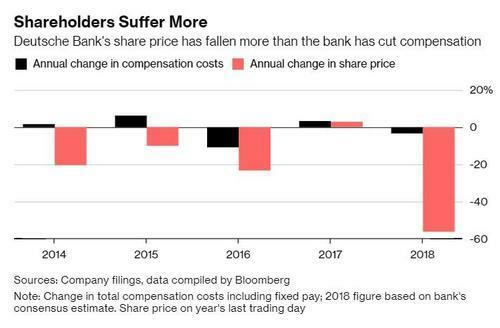 Distressed Deutsche Bank plans on cutting the company's bonus pool by about 10% this year as the bank struggles to stay afloat, while at the same time trying to retain employees, according to a new Bloomberg report. Bonuses are going to be paid more selectively in an attempt to keep the people that earn the most for the bank, according to the report. 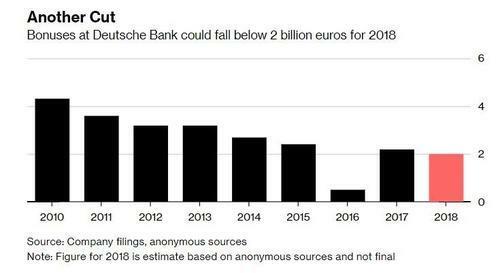 The bank awarded about €2.2 billion in bonuses ($2.5B USD) for 2017, meaning that the company could still be spending ~€2 billion on bonuses this year, even after the targeted 10% cut. The bank's CEO, Christian Sewing, is said to be trying to "keep a lid" on costs. The bank's stock has been slaughtered over the last year and the share price is currently less than half of where it needs to be for retention awards that have already been issued to employees to vest. This is causing some top performers at the bank to consider leaving, while frustrating others. The bank's revenue for 2018 is slated to be the lowest since the 2008 financial crisis and the article notes that the bank's fourth quarter was "negatively affected by police raids on the lender’s headquarters in November". Meanwhile, the bank's CFO, James von Moltke, used the all-to-vague and perfunctory "weak market environment" excuse for the decline in revenues. The bank's new CEO has already announced his intention to cut 7,000 employees by the end of this year and the bank said it has already cut 1,000 front office jobs in the second and third quarter of 2018.